Add Zest to Your Family with God’s Rest. Seriously, your schedule is hurried, your expectations are extraordinary, and you and your family’s commitments are too many to count. Your relationships with your friends, your family, and your God are suffering. Ready for a change of pace? Here’s help. 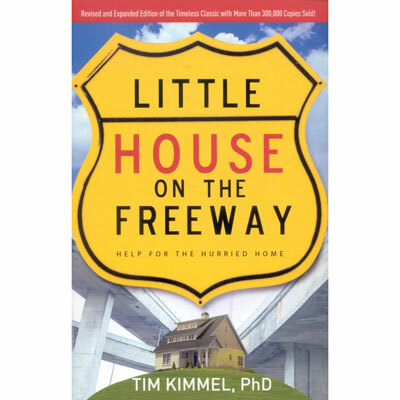 Little House on the Freeway takes a look at the breakneck speed at which we live and reveals how to not only put on the brakes, but how to get off the freeway altogether. With a special section, “101 Ways to Give Rest to Your Family” and a new chapter that addresses the perils of the Internet, this timeless classic about the importance of quality family time has been updated to rescue a whole new generation from hurry. Not only is Tim a well-known speaker, he has authored many books including: Little House on the Freeway (featured in the Billy Graham crusades), Gold Medallion Winner; Grace Based Parenting, Raising Kids for True Greatness, 50 Ways to Really Love Your Kids, Raising Kids Who Turn Out Right, Why Christian Kids Rebel, The High Cost of High Control, and Basic Training For A Few Good Men. He has also developed several video studies including The Hurried Family, Basic Training For A Few Good Men, Raising Kids Who Turn Out Right, and Grandparenthood: More Than Rocking Chairs. Tim has been a featured guest on radio and television programs such as Dayside on FOX News channel, Focus on the Family, The 700 Club' Moody Broadcasting's Midday Connection, and FamilyLife Today®. Tim married Darcy, his high school sweetheart, in 1972. They are the parents of four children, have a wonderful son-in-law, and have two grandchildren. They reside with their family in Scottsdale, Arizona.